1) Central Bank made a relaxation of monetary policy for the first time in two years! 0.25% rate cut on policy ceiling rate. It can be a good starting signal. Foreign activities in cse is fading day by day, especially in these days. buying getting slow. Is that the political uncertainty the only reason ? After all, Will there be a new tax structure with effect from April 1st?Again CGT fear? Btw, I really don't see a political uncertainly Next 2 years is set anyway. Can you guess why I was rather sure there is no political uncertainty till 2020! 3) CSE will start finally going up little by little. There are many people viewing here, but so less comments/interaction in any post. So it is usually boring or have no incentive for genuine writers to post in the forum. Just trying add some activity to the forum . Do post your opinion/view if you care. Let see come comments if you care to see the forum active ! Despite winning the NCM yesterday, actually, Mr "Toddy-Blue" lost the Confidence of the masses on the 09th of January for failing to take the first step. Illgotten money can bring superficial political stability but all know that they are dealing with the present day Cassius and Brutus. NATO boys have no long-term plans except borrowed old versions and that makes investors jittery. Inconsistency in the CSE is making people seek other ventures to channel their money. Good reply to one of the questions, but i think there is fact which goes beyond the "venerated god called money"
Now the Governor of CBSL is a wise and a patient man. We are lucky to have such a person in such a position. Should a Central Bank involve in escalation of Asset prices. This is questioned in BLUFF written by Anjum Hoda. Central Banks push down rates to increase economic activities which will increase the spending and earnings which will result in demand for equity. Political news often made ups and downs in Market yet such news was not often strong enough to change the direction of CSE recently. The viewers are often interested in hot tips. Buy this share and we ensure this much gain. Then there will be enough short replies. This is the trend of Sri Lanka. 1) Well in the past , 2 things were used for market games ( up or down). "The viewers are often interested in hot tips. Buy this share and we ensure this much gain. Then there will be enough short replies. " Many want to see short term price hikes of their shares ( or drops to collect) . or about to have interest on ( to collect). Some will only like their "friends" posts . Some just comments/give likes to an opposer reply ( even if it has wrong facts or mal intentions) as they hates the original poster ( who actually gave the right info). When will Sri Lankans motivate the right people ( same as electing the right politicians) ? 1. Their term is shorter than the term they enjoyed... Just two years and three is gone. 2. People are not happy with what they have already done and they know that they have the support of a majority of the population is three years old concept and the recent elections are not in favour of them. 3. Its always better postponing elections specially when people are not happy. 4. If you give up the National Government, you cannot enjoy the perks of a Cabinet Minister and there will be lesser chances of rejecting by the people but electing by the President as seen last time . So its better to enjoy the perks now. This dilemma of the politicians mind will create following. 1. Enjoy the maximum, collect as much as wealth you can within two years and till then postpone thinking about future. 2. Do something worthwhile to the country. What ever it is we are experiencing the lowest GDP growth within 16 years and highest ever records of FOREX and the beauty is who cares? nations never fail without the support of its own citizens who are digging their own graves. In some other thread Softlogic Owner says he took loans at 30% + amidst of war. Now what are the obstacles for development? Not only the one you picked ... but actually everything said below is the truth. 4) and 5) usually goes hand in hand. 2) Many want to see short term price hikes of their shares ( or drops to collect) . 4) Some will only like their "friends" posts . 5) Some just comments/give likes to an opposer reply ( even if it has wrong facts or mal intentions) as they hates the original poster ( who actually gave the right info). CK wrote: Ranil is the Man..right? To me Ranil is not the man. Nor is MR.
Is CSE will be dull forever ? Why we don't collect slowly ? first of all thanks for being active in the forum. When you are active in the forum, it is like '' The (Good) Captain of the ship is Back Onboard''. The rest of the crew/passengers onboard get an assurance that this Captain will navigate the ship out of Danger. You have vast knowledge/Experience regarding CSE. You or a person like you with the same caliber should be leading the CSE/SEC, like Dr.Coomaraswamy leading the CBSL now. we need like these people as ministers/institution heads and finally a wise educated man as a president. For your first question, I am unable guess the reason why you were sure. But as per my knowledge on Srilankan politics, i was sure Mr.Ranil will defeat NCM. There are influences from our neighbour country, the country which is going to be next super power and the current super power as well. For your second question, I will go with your last answer. Thanks Sls for bringing up an important topic. The market might temporarily go up and mostly a range bound one, 6300 - 7000. Within the past 38 months, ASPI lost over 1000 points due to anti investor policies and these policies would continue for the next 2 years as well. Another big threat is the depreciating rupees and foreigners would affect due to this. Banking and finance sector - We have to wait and see the impact of IFRS 9. This might have an adverse effect on the profits of banks and finance companies. Future123 wrote: Thanks Sls for bringing up an important topic. Can you or some one simply explain about IFRS 9 ? What I heard was that impairment will increase in Banks and Finance sectors as the IFRS 9 approach is more prudent based. This standard doesn't allow delaying in recognizing credit defaults. Therefore, more efficient recovery system should be in place to recover the dues from customers. IFRS 9 requires an impairment allowance against the amortized cost of financial assets held at amortized cost or FVOCI. The change in this allowance is reported in profit and loss. For most such assets, when the asset is acquired the impairment allowance is measured as the present value of credit losses from default events projected over the next 12 months. The allowance remains based on the expected losses from defaults over the next 12 months unless there is a significant increase in credit risk. If there is a significant increase in credit risk, the allowance is measured as the present value of all credit losses projected for the instrument over its full lifetime. If the credit risk recovers, the allowance can once again be limited to the projected credit losses over the next 12 months. An exception to the general impairment model applies to financial assets that are credit impaired when they were originally acquired. For these assets, the impairment allowance is always based on the change in projected lifetime credit losses since the asset was acquired. "The new impairment model is intended to address a criticism of the impairment model used during the financial crisis, that it allowed companies to delay recognition of asset impairments. The new model requires recognition of full lifetime losses more quickly, FASB elected to use a different approach to accelerating recognition of impairment losses, requiring full lifetime recognition from the time the asset is acquired, referred to as the "current expected credit losses" or CECL model. Under both IFRS 9 and the FASB model there will be a loss when most assets covered by this guidance are acquired to the extent of the allowance. This loss will be smaller under the IFRS 9 model, due to the 12 month limit." sorry for being late for reply sir..
for your question 1, I have no idea about that. Maybe I;m politically immature.But Im mature enough to understand ,whoever the rulers are, all these corrupted politicians dragging the country to hell day by day. as per my view, these NCM is a pre-planned saga to hide former CB arresting case , petrol hike etc. 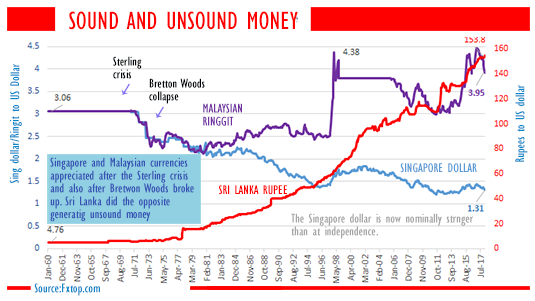 according to this chart,In 1960 , when LKR stands in 4.75 against USD, sing dollar & rinngit was 3.06. Now after 58 years ,sing dollar has been appreciated to 1.31 & ringgit defending their place at 3.95 meanwhile the almighty politicians who guide the country to a miracle in asia has rocketed our currency to 155. I like to pick no 03.recent past CSE has proved though he made some temporary small fluctuations with the political news , with the foreign inflow back up I think the target has been set.policy rate cut definitely will add fuel to the journey. That's been a super chart. It could have been a super super chart if you used the same scale for all currencies ,probably, with some log scale; and added few more currencies from the region. So the chart says that, Sin $ and LKR started to move in opposite direction starting from 1970. And it shows that, in 1977, some old and ugly magician has injected some boost to LKR. It would be great if we can correlate incidents and decisions made by respective country leaders, made the currencies to behave in that manner. Have you done it already elsewhere?? You may have replied late , but you replied with a very enlightening graph attached. That great and thanks for that. I like to draw people's attention to a few CRUCIAL and Deeper points if someone is really interested in analyzing this mess for the sake of Sri Lanka. Do you think Sri Lanka Rs went to the dusbin due to the "Open Economy" in late 1970s? b) Has Open economies helped other countries in Asia ? So where was the real problem? 3) This is the most important observation and sadest story based on the graph. Anyone of you can answer by looking at it. As far as Rupee going to the dustbin ( vs the $) , what period ( from what year to what year) were the worst in Sri Lankan history? b) it took roughly another 13 years only to go from Rs 50 to 100.
and lets analyze for the sake of OUR MOTHERLAND. So where HAVE WE GONE WRONG and STILL GOING WRONG ? Hang on for a tick mate. What we should compare is not the absolute value, but the % rate the LKR going to the dustbin. Usually it has taken 10 years to make the LKR value become half. But there is one 10 year period where the drop was less than half. BTW: 10 years to double means, 7.2% depreciation per year. So we have been depreciating LKR by 7.2% year by year for nearly 50 years. Ah.. I was well waiting for this comment . Look at it this way ..
1) What are we shooting for ? To have Rs vs $ curve on a exponential bias ? Sri lanka can be Romania in no time! ( ie need Rs million notes to trade as currency has no value) . 2) What we should really be concerned is the purchasing power over time vs devaluation vs inflation. a) How much was a loaf of bread in SL , 10 year ago? b) How much is it now and relatively how many times peoples earnings have gone up? was selling for about a $1. Today it is selling for around $1 too. matters hugely as relatively people buying power/earning don't go up anywhere close. But prices of good sky rocket exponentially. Nope!. This should be looked at from a relativity based angle. What matters is the % increment against the Dollar. Imaging; this year the rate per dollar increased by one rupee. Imagine; they change the rate by one rupee 50 years ago. In 40 years time, when a dollar sells at LKR 2350, would you or your nephew care if the rate changed by 50 rupees? My turn to say Nope. You didn't get the bigger point I mentioned. It is not the Rs 50 am talking about here. It the devaluation time ( which is on a exponenial graph ) and its effect it has on goods prices going up relative to buying power. What matter is how many rupees you earn and what can your money buy with it. Really appreciate your chart on Forex. You have inserted a very good presentation of the Forex managing of different countries shows different thinking patterns among economists. 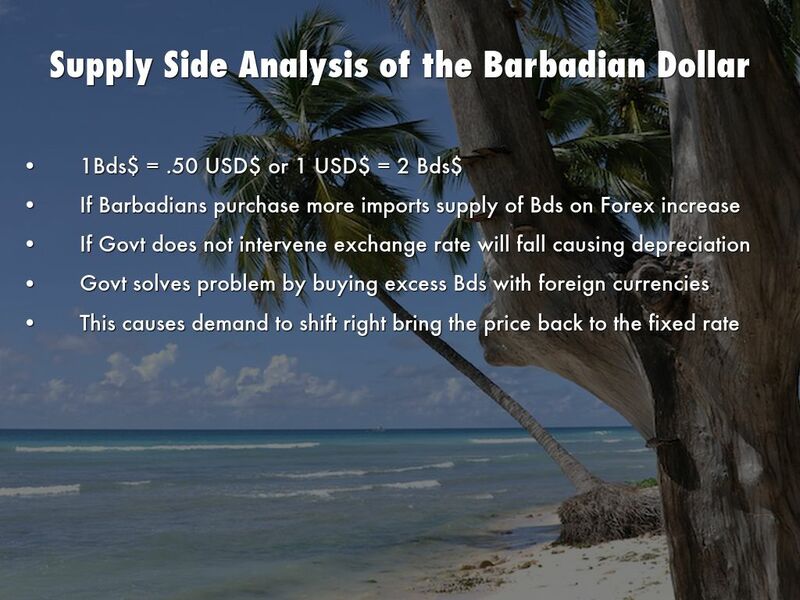 I once wrote and article in this forum about how Barbados managed their Forex which was fixed against USD. We are telling the same thing mate. You are talking of absolute change. I am talking of relative change. The argument is which is more significant. What is the impact if SAMP share goes up by 10 rupee this week. But what if it went up by 10 rupees the same day of listing 30 years ago. Would the impact be the same?